← Meet your local coppers this Saturday in Aldridge! Never one to sit back and let life pass her by, that there Kate Cardigan from the wonderful Lichfield Lore is involved with another project – Lichfield Repair and Share workshop – which takes place this Friday, 16th March 2018 at the Tesco Community Room, Tesco Extra, Church Street, Lichfield from 7-9pm. Kate, who’s more usually known for her excellent work with Lichfield local history group, Lichfield Discovered and other projects, is involved with this interesting community project to help people repair, recycle and put back to good use things that my be broken or need some love. This looks like a great way to have fun, meet up with other like minded folk and also learn some new skills. On Friday 16th May, between 7pm and 9pm, we’re holding the repair & share event at the Tesco Extra Community Room, at Tesco in Church Street, Lichfield. We have a team of volunteers with a wide range of skills who will be showing people how they can fix their broken items or give their old things a new lease of life. Anyone with anything that needs a bit of TLC can bring it along to see if we can help. We want to increase peoples’ skills and knowledge about how to repair and restore things and reduce the amount of stuff that ends up as landfill. We’re so grateful to all those offering their time and skills and delighted that the idea has been met with such enthusiasm. We hope it will be the first of many similar events, both here at the farm and elsewhere in the area. Lichfield Re:Cycle will be on hand to help people with bike repairs and maintenance, and we can also offer help and advice on upcycling and repairing furniture and clothing, IT health checks, social media and small business advice, repairing appliances & electrical devices and vehicle maintenance. 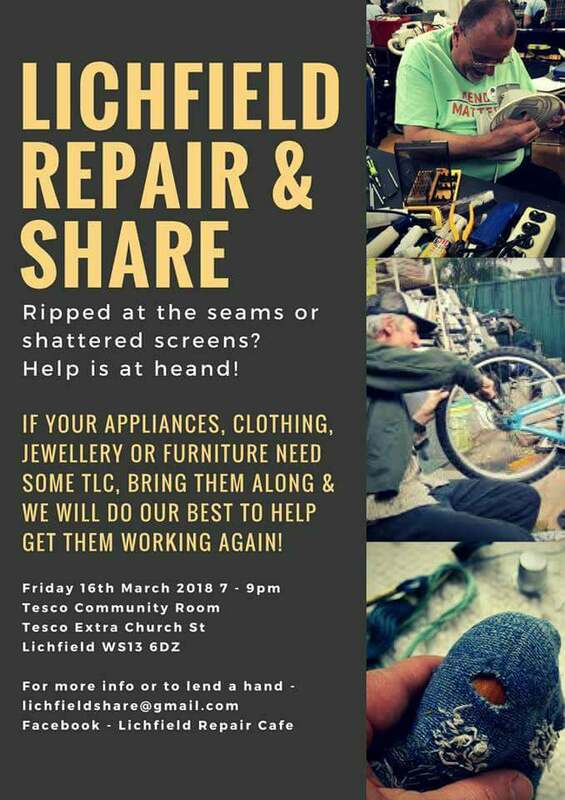 For more information, contact Kate Gomez at lichfieldshare@gmail.com or joing the Lichfield Repair & Share group on Facebook here. This entry was posted in Churches, Environment, Events, Followups, Fun stuff to see and do, Interesting photos, Just plain daft, Local Blogs, Local History, Local media, News, Reader enquiries, Shared media, Shared memories, Social Media, Spotted whilst browsing the web and tagged 2018, cardigan, community, Discovered, event, Events, Facebook, free, Gomez, Kate Gomez, Lichfield, local blogs, Lore, March 16, Recycling, Repair and Share, Staffordshire, Tesco, Things to do. Bookmark the permalink.